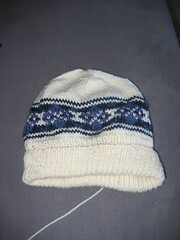 Em's Knitty Corner: Someone please slap me! Ok, I'm going nuts here. I've been buying way to much yarn lately. It's just silly to see how much stuff I have bought the last 2 weeks! And then Becky lured me into buying even more yarn! :D Don't worry Becky, I'm ok with it! I'm sure I'll put the yarn to good use, and I still have some room in my stash. Well, speaking of stash, I should try to get rid of some stuff I'm sure I will never use, but that's for one of the coming weeks. Last Friday my sister and I went shopping together. Had been a long time since we did that, but somehow I always enjoy going shopping with them. Anyway, before we went to my usual fave LYS we decided to check out a yarn shop I never had been too, but they were mentionned on the Rowan homepage as carrying the brand, so I wanted to check it out. I was expecting a shop with a little bit of Rowan, as it was called "Stoffenidee", so I tought they would mainly carry fabrics (that's what the name sais). 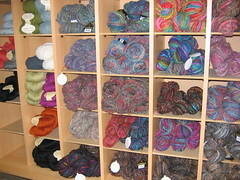 Ok, you need to look really close, but this is actually a rack filled with NORO! I'm not kidding you! There is a store in Belgium actually selling Noro yarns! I have to say my sister and I both fell in love with it and I took home 3 balls! Then on a clearance isle we found quite a bit of Rowan Polar! Sis took home enough for a cardi (which of course I have to knit) and she's going back to pick some up for me! I have to say, my sister is really picky when it comes to yarn (everything is itchy) but she loved quite a bit in the store! Then we went to my fave LYS and I had quite a few things there waiting for me. The lady always puts things aside for me! I really don't care at all for Shadow knitting and will probably never do it again in the future. It was great to try this by doing a sock. Oh, and by the way, I will be skipping the new SixSocks pattern. I don't care for knitting with beads at all and I don't feel like knitting socks with beads in paticular. No pics yet, but I'm getting along nicely with the Kiri Shawl. I casted on late Friday night, and dit the first shart and one repeat of the second shart. I didn't knit on it on Saturday - we were watching movies so I knitted a bit on the socks - but I did knit 2 more repeats of the second shart yesterday. It's turning out really nice. I'll try to get a nice picture soon, but I'm using a black 100% mohair yarn, so it's kinda hard to photograph before blocking. 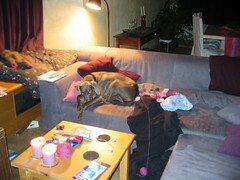 I'm leaving you for now with a picture of my knitting spot on the couch. Somehow, every time I leave, my dog needs to settle there, no matter if she's having more then enough space. And usually, as can be seen on the picture below, she manages to get my balls of yarn rolling (though she's really great in keeping away from my yarn and knitting!). I known the shop stoffenidee because I live in Gent.